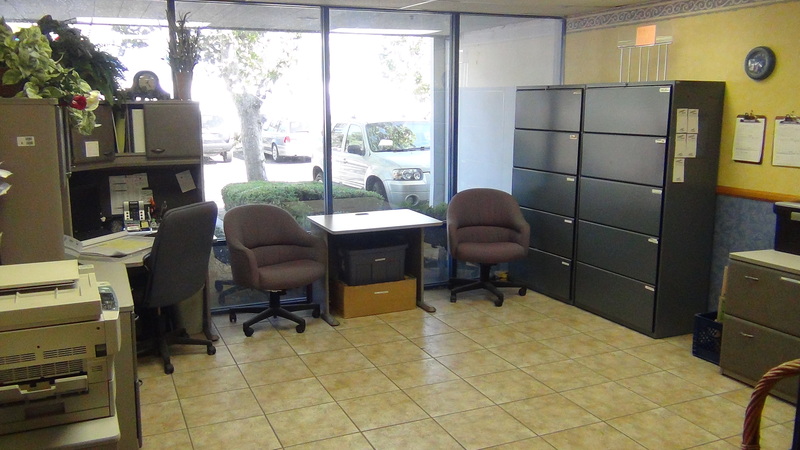 AFTER – Enjoy your office, enjoy your work. 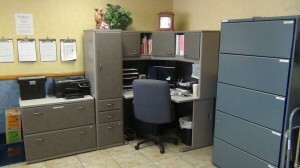 Now Habitat for Humanity staff have a great work space, organized beautifully to be inspiring, functional and supportive. Habitat for Humanity is part of Temecula’s heart beat. AFTER – Thalia Poulos, Professional Organizer with Organized Beautifully, after a fun day’s work organizing Habitat for Humanity’s office. Everyone at Habitat for Humanity – staff and volunteers – pitched in to help me. Thank you — we did it!! 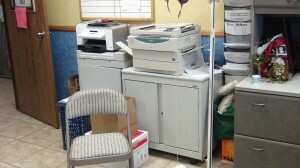 BEFORE – The Office Problem: Blockages at every turn. We needed to purge and declutter! When points of access are blocked it only leads to more blockages. Cannot access file cabinet bottom drawers so stuff that goes in there sits waiting. 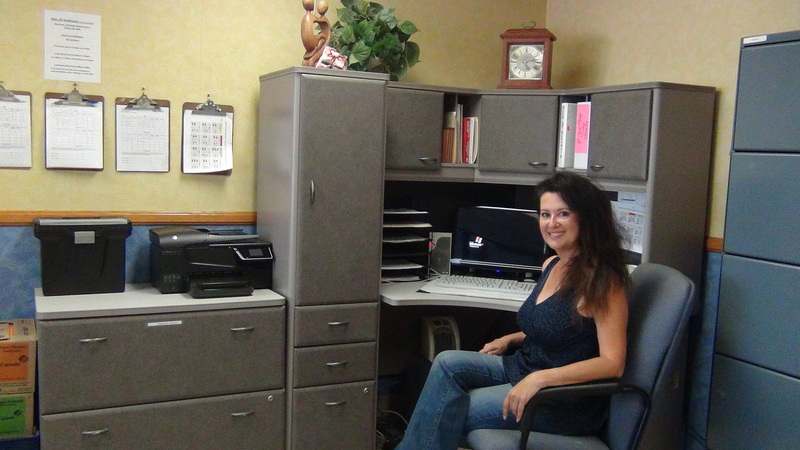 Organized Beautifully make-over at Habitat for Humanity in Temecula by Professional Organizer, Thalia Poulos. In the thriving community of Temecula, known as southern California’s wine country, is the office of Habitat for Humanity and its ReStore where items are accepted as donations and resold to help fund Habitat’s many housing programs. Referencing an interpretation of the African proverb, “It takes a Village”, Habitat for Humanity reaches out to the community to make it a better place. They give so much back to their village. 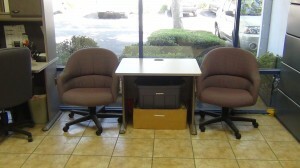 The ReStore is super organized and the shoppers can easily find whatever they’re seeking. I’ve always commented on every time I take my clients’ donations there. Things are grouped well, you can see everything, the inventory is always new. BEFORE – This office space has an Open Door policy that created a dumping ground for other people to pile things up. After a few years that took its toll. In the office, they are blessed with a great space for their office. Blessed in the sense that it’s a huge office; however, a huge office can become a dumping ground when the policy is “Open Door”. The largest office in the building ended up being the catch-all for anything that didn’t have a designated spot. The office is shared by staff members who are quite organized. They are Triangle Organizing Personality Styles so they have a natural intuition about how to organize. They like some pretty things out, but prefer things behind doors, in file cabinets and tucked away. That’s the trait of “Visual” organizing personality styles. They want it pretty! It’s the other folks who work there who are the culprits causing this office to get out of control. That can be an issue when you’re sharing office space. One must draw the line! AFTER – Great feeling to walk into your office and find it inviting and organized. Energizes you! Just one clock now instead of 8. See the before photo. 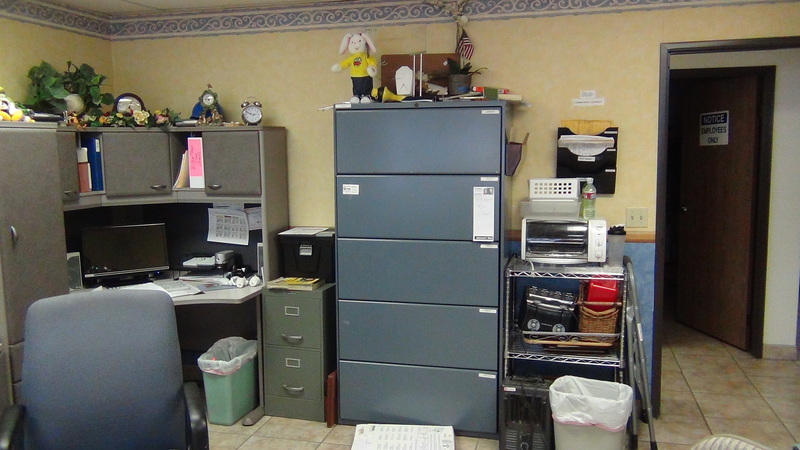 So, with a team of four of us, we all rolled up our sleeves, purged massively, grouped like-king items, used the ample office filing cabinets to “go vertical”, used my trusty Brother P-Touch labeler and even created a mini-sanctuary at the area in front of the window. Anything that wasn’t an integral part of day-to-day business is out of there. AFTER – We so lucky to have great natural light. There is a second office set-up here at left, and of course we organized that one too! 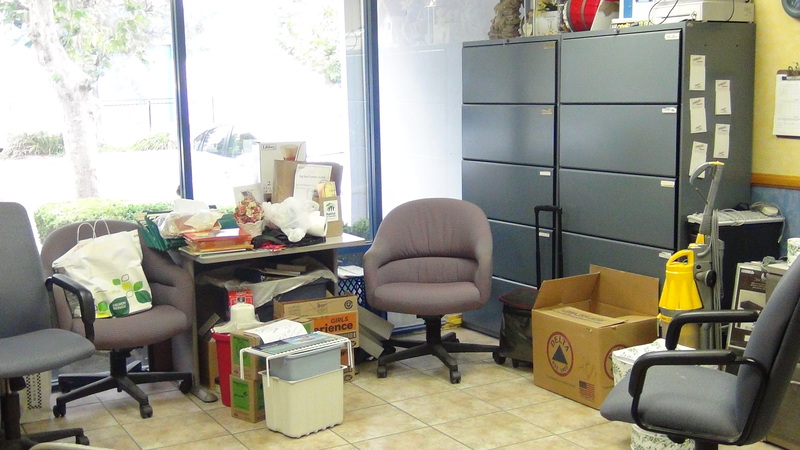 We created a place for everything, including what was in those boxes on the floor, removed the clutter, donated mountains of items to — guess where — creating a harmonious office space where these very special employees and volunteers can thrive. All we need now is a nice-looking, deep shelving unit with doors — and, when that shows up from a kind donor, we’ll be finished! That’s for “special projects” that inevitable emerge for various fund-raising campaigns. And, that’s a good thing for Temecula! Those items will not end up on the floor creating blockages ever again. 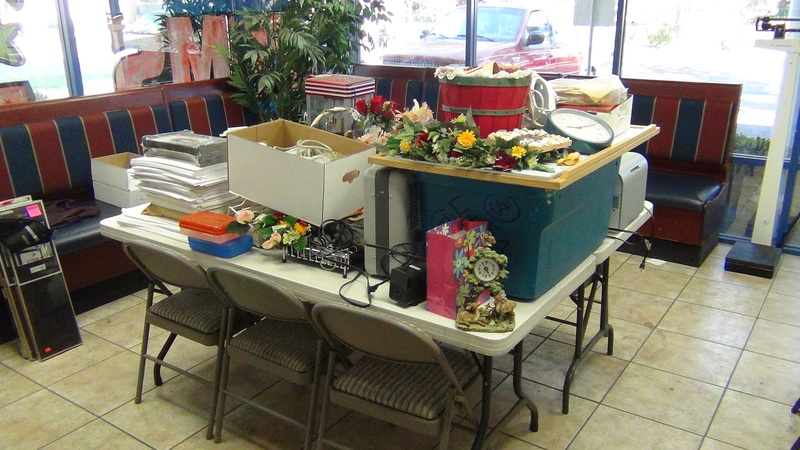 DURING – These items were all removed from the office and can now be sold in the Habitat for Humanity ReStore. Two days later when I went back, everything was off this table, priced and in the ReStore. Excellent time management! 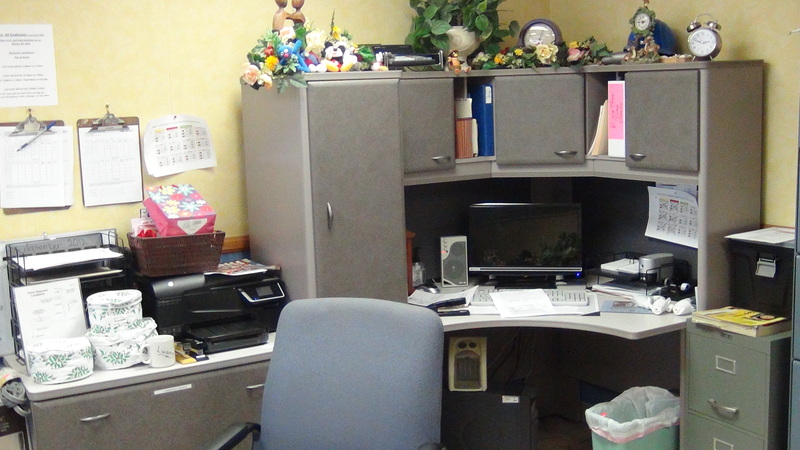 BEFORE — Co-workers brought clocks and placed them on top of this staff member’s work area. She just wanted one nice clock that tells good time! 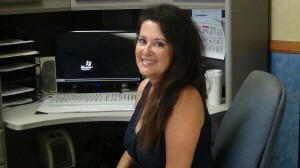 Thalia Poulos Professional Organizer with Organized Beautifully works in San Diego and Riverside County. BEFORE – Leaving chairs in the middle of the room? It’s just another blockage — fold ’em up and put ’em away!